Some of you may remember the heroic death of our dearly departed Spacebat. Some of you may still be grieving. NASA, however, has moved on to a new tragedy. Its latest victim? 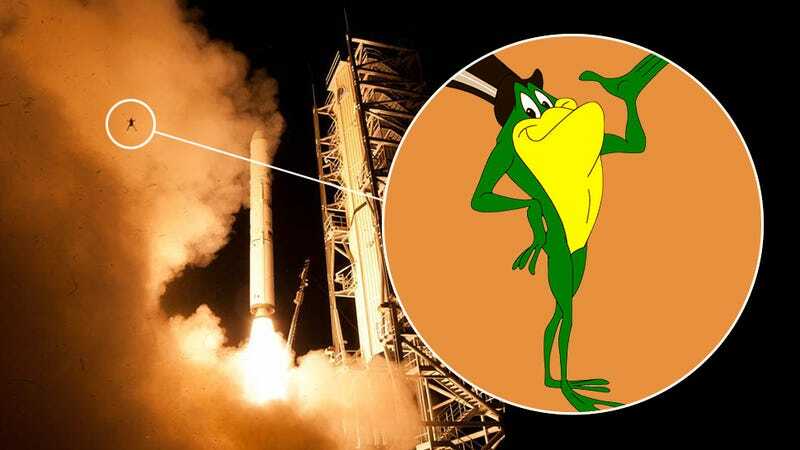 The most powerful goddamn jumping frog the Wallops/Mid-Atlantic Regional Spaceport has ever seen. RIP Spacetoad. You flew too high. Last Friday, September 6, the Minotaur 5 rocket sent the LADEE spacecraft off in a burst of flame, but little did the astronauts know, there was one more crew member ready for blastoff—Spacetoad's Final Blastoff. We know he likely wandered in from the nearby "pool" for the high-volume water deluge system activated during launch, but the question of "why" will forever remain. Was it all a horrible accident? A cry for help? Did Spacetoad's addiction get the better of him as he constantly searched for that ever-elusive high(jump)?